If you or your loved one has a Lingraphica speech-generating device, and you've seen a positive impact in communication, we want to hear from you! We often hear that device owners are better able to communicate, feel more independent, and have more confidence in social settings due to their Lingraphica devices. Now, we'd like you to share those stories with others who haven't yet discovered the possibilities of a Lingraphica device! 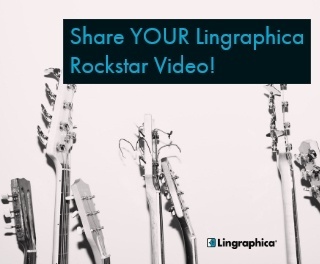 Share YOUR Lingraphica Rockstar Story! Caregivers or Communication Partners: If you've got a smartphone and five minutes to spare, you can create an awesome video of your loved one or friend that can help others see how a Lingraphica speech-generating device can change someone's life! Never made a video? It's super easy! Just follow these four steps, and PRESTO! You've created a video that we want to share. Let's get started! 1. Have a few questions prepared to ask your loved one/friend; be sure that they have the answers programmed in on their device. Example: "What did you eat for dinner?" Answer using the device: "Chicken." 2. Make sure everyone is comfortable. This is a casual, realistic recording. We're looking for about 30 - 60 seconds per video, so it can be quite simple and natural. Don't worry about making it "perfect." As long as it's authentic, that's great. 3. Hold your phone HORIZONTALLY when recording. Try to hold it steady, or consider using a tripod. 4. Visit https://aacdevice.aphasia.com/lingraphica-rockstar/ to submit your video and agree to allow Lingraphica to use the video on social media and our websites. Here is an example of a video. Thank you for taking five minutes to help other people with aphasia and caregivers see what a Lingraphica device can do to improve quality of life and communication!